LA JOLLA—How the brain functions is still a black box: scientists aren’t even sure how many kinds of nerve cells exist in the brain. To know how the brain works, they need to know not only what types of nerve cells exist, but also how they work together. Researchers at the Salk Institute have gotten one step closer to unlocking this black box. Using cutting-edge visualization and genetic techniques, the team uncovered a new subtype of nerve cell, or neuron, in the visual cortex. The group also detailed how the new cell and two similar neurons process images and connect to other parts of the brain. Learning how the brain analyzes visual information at such a detailed level may one day help doctors understand elements of disorders like schizophrenia and autism. 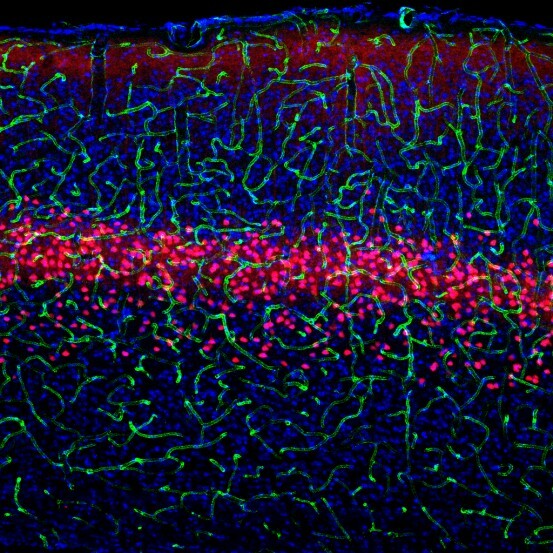 Salk scientists discover the function and connections of three cell types in the brain that process visual information. 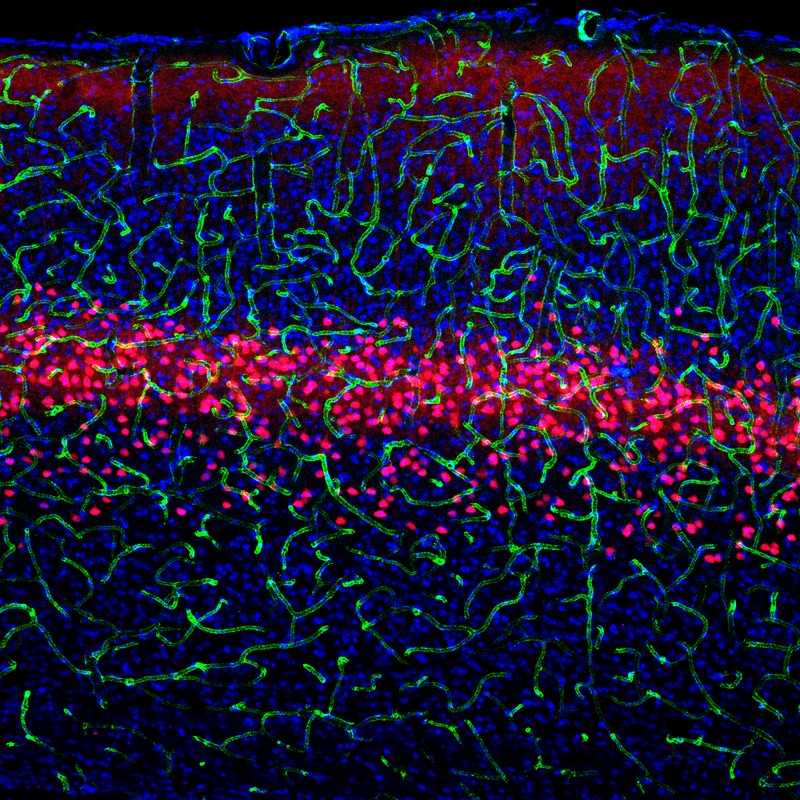 Pictured here is long-range projecting pyramidal neurons (red) in layer 5 of the visual cortex with vasculature (green) and nuclei (blue) labeling. “Understanding these cell types contributes another piece to the puzzle uncovering neural circuits in the brain, circuits that will ultimately have implications for neurological disorders,” says Edward Callaway, Salk professor and senior author of the paper published December 6 in the journal Neuron. Unlocking the detailed workings of the brain has been a slow-going challenge. Historically, scientists used stains to show that various neurons have distinct shapes, and are likely different types of cells. Yet, the true number of neuron types in the brain remains a mystery. Callaway compares the task of unraveling neuronal connectivity and function to intelligence surveillance. Twenty years ago, the technology to track connections between various neurons in the brain was about as sophisticated as filming a group of people on a city corner talking on cell phones: each person is talking to another, but the person on other end of the conversation may be a block away, or across the country. The content of the conversations would be impossible to deduce. “Similar to those cell phone conversations, each type of neuron is only connected to certain other types of neurons, but it could be a cell anywhere else in the brain,” says Callaway. New mouse models and other technology developed in the past five years offer mapping tools as powerful as phone-tapping surveillance, allowing scientists to track “what are the neuron types, which cell types are talking to each other, and what are they talking about,” he said. In their new paper, Callaway and colleagues chipped away at these questions by selectively genetically manipulating specific cell types in animal models to visualize the size, shape and electrical activity unique to individual types of neurons. The three neuron types the team studied are part of a larger classification of neurons called excitatory pyramidal (named for their shape) neurons, and play an important role across the cortex of the brain. Although all the experiments were done in the visual cortex of mice, the same neuron cell types likely exist and play similar roles in the brains of many animals, including humans. “Previously, people did not have very good tools to label, or look at, specific pyramidal cell types in the brains of awake mice. But using this cutting-edge visual technology, we could see the cell activity and how each cell type may process different kinds of information for different purposes,” said Euiseok Kim, first author of the Neuron paper and a Salk research associate. The Salk scientists used special imaging techniques to show how, and when, the three cell types were activated in response to different images shown to a living mouse. To trace the new cell’s neural circuit, the team used a modified rabies virus method invented by Callaway’s lab to map the connections between the three neuron types and cells in the rest of the brain. The combination of the two imaging tests painted a picture of the different neurons’ functions. Two neuronal types that were sensitive to fine-detailed spatial information in the visual tests were also mapped to parts of the brain responsible for parsing various bits of information. Similarly, the neurons that responded to direction and speed in the visual tests were shown to connect differently to the parts of the brain in the rabies mapping experiment. Callaway expects future experiments will likely determine even more functions of these neurons. Learning how cell types are connected and function under different circumstances can ultimately help explain what goes wrong in various conditions such as autism and schizophrenia. “The part of the brain we studied was the visual cortex, but the cell types we’re looking at are also found in every other part of the cerebral cortex, such as areas involved in motor or cognitive functions,” Callaway adds. 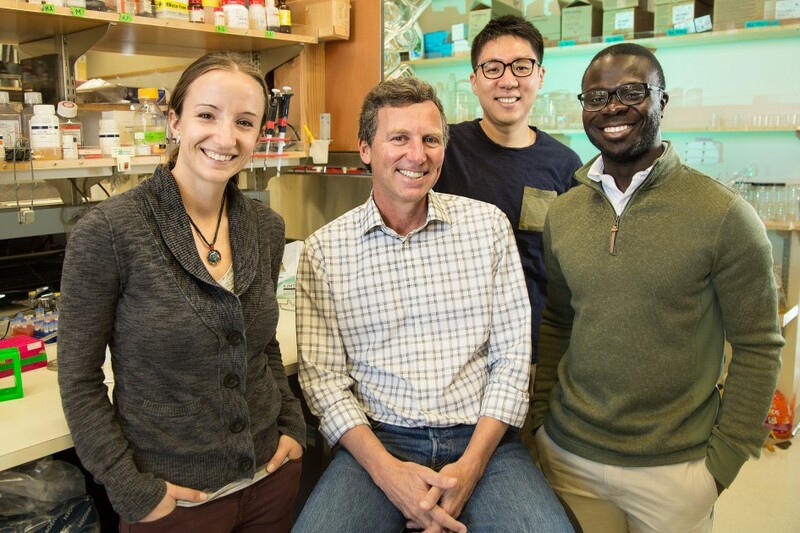 Other authors include Ashley Juavinett, Espoir Kyubwa and Matthew Jacobs of the Salk Institute. This work was funded by the NIH, the Gatsby Charitable Foundation, the National Science Foundation, the Martinet Foundation, the Howard Hughes Medical Institute Gilliam Fellowship and the University of California, San Diego Medical Scientist Training Program.